Parasitoids of leaf-mining Diptera (Agromyzidae) in tropical and subtropical areas (Boucek, 1988). Reared from Callipappus rubiginosus Maskell (Hemiptera: Margarodidae) in Australia (Boucek, 1988). Hosts unknown but almost certainly parasitoids of with xylophagous beetles. The species develop as parasitoids in eggs of cerambycid beetles (Ferrière, 1936). Macromesa amphiretus has been reared on the Continent from several species of bark beetles associated with conifers (Graham, 1969). Species are frequently reared as parasitoids of stem or leaf-mining and gall-forming Diptera such as agromyzids, chloropids and cecidomyiids (Cameron, 1939; Askew, 1965). 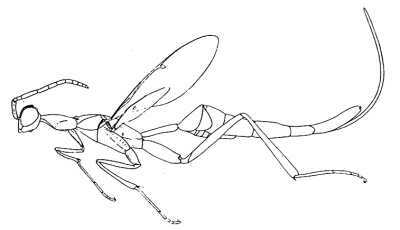 Some miscogasterines attack other insects in similar concealed situations. For example, Seladerma aeneum has been reared from cocoons of leaf-mining Lepidoptera of the genus Stigmella (Nepticulidae). Many species of the tribe Trigonoderini are known to parasitize Coleoptera. Plutothrix coelius and Platygerrhus ductilis have been reared from anobiids; a species of Trigonoderus is known to parasitize a lamiid (Kerrich & Graham, 1957); a species of Janssoniella is associated with ciids; and Platygerrhus dolosus is recorded as an ectoparasitoid of Laemophloeus ater, a cucujid predator of a scolytid (Ferriere & Kerrich, 1958). 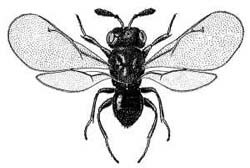 In addition to the above host groups, a few miscogasterines have been recorded as parasitoids of case-bearing Lepidoptera and puparia of calliphorid and muscid Diptera. The hosts of species of this subfamily are unknown. Ormocerus latus is parasitic in the galls of Neuroterus albipes (Cynipidae) (Graham, 1969). Parnell (1963) observed that the larvae of Systasis encyrtoides are voracious carnivores, killing and feeding on cecidomyiid larvae in broom-pods (Sarothamnus). Trichilogaster species form galls on Acacia with at least one species proving to be useful in the biological control of this plant in southern Africa. Hemadas nubilipennis forms galls on blueberry and is a minor pest of this plant in north America. In Sweden, a species has been recorded as a predator of eggs of Delphacidae (Homoptera) in the internodes of various grasses (von Rosen, 1956). Parasitoids of Cecidomyiidae (Diptera) (see Graham, 1969 as Pirenini). Some pteromalines are ecto- or endoparasitoids of larvae of Coleoptera (especially those of Scolytidae, Bruchidae and Curculionidae) or hyperparasitoids, sometimes parasitizing other pteromaline primary parasitoids (Parnell, 1964a). Anisopteromalus calandrae is a well-known cosmopolitan parasitoid of Coleoptera and Lepidoptera that infest stored products (Burks, 1979). 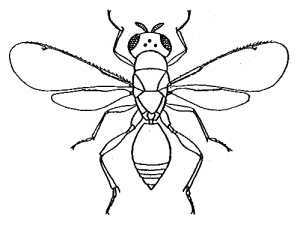 Xiphydriophagus meyerinckii parasitizes the wood-boring larvae of xiphydriid woodwasps (Skinner & Thompson, 1960). 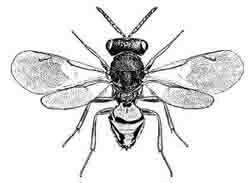 A number of species are ectoparasitoids of prepupae of aculeates such as Vespidae, Sphecidae and megachiline bees. Others are solitary ectoparasitoids of gall-forming insects such as cecidomyiids, eurytomids, cynipids and Symphyta, and their primary parasitoids; some may even develop partially as phytophages, feeding on gall tissue (Askew, 1961b). Other species (eg Pteromalus puparum, Psychophagus omnivorus, Nasonia vitripennis) are gregarious parasitoids in the pupae of Lepidoptera or the puparia of synanthropic cyclorrhaphan Diptera. A few pteromalines are known to be ectoparasitoids of endophytic larvae such as those of Lepidoptera and Tenthredinidae, or to develop as solitary ectophagous hyperparasitoids via the larvae of Ichneumonidae, Tachinidae, Eupelmidae, Braconidae and Platygasteridae (Finlayson, 1960). Dibrachys cavus has been described as the most polyphagous of all chalcids (Burks, 1979) and, though it normally seems to develop as a primary or secondary parasitoid of lepidopterous hosts and cyclorrhaphan dipterous puparia, it has been recorded as a tertiary parasitoid, and even as attacking spiders, earwigs and the larvae of lacewings, beetles and bees. Several species are hyperparasitoids of Aphididae and Coccidae. Pteromalus platyphilus is a predator of spider's eggs and Mesopolobus aequus also develops as a predator, in plant stems where it feeds on the eggs and larvae of other insects (von Rosen, 1956). 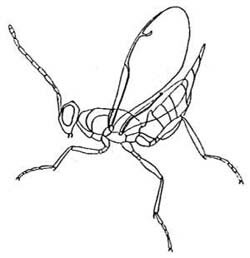 Spalangiines are parasitoids of cyclorrhaphous Diptera, especially species of the families Muscidae, Calliphoridae, Sarcophagidae and Tephritidae (Graham, 1969). 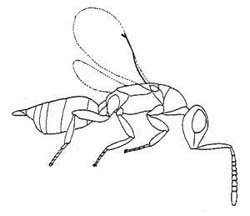 Spalangia crassicornis is a parasitoid of myrmecophilous Diptera associated with the ant Lasius fuliginosus (Boucek, 1963). Spalangiines develop as solitary ectoparasitoids of the host pupae within its puparium. The life history of one species was studied in detail by Richardson (1914). Graham, 1969 (British and Western European species); Peck, Boucek & Hoffer, 1964 (Central European genera); Ferriere & Kerrich, 1958 (British species of Cleonyminae); Boucek & Rasplus, 1991 (Palaearctic genera); Boucek, 1988 (Australasian genera).